Locally, more than 16,200 pounds of turkey and nearly 2,300 pounds of nonperishable items were collected during the two-week drive, which ran from November 2 to 16, with donations from homeowners, real estate agents, developers, lenders, trade partners and team members. Tampa team members donated the items to the organization, equating to more than 15,000 meals, which were picked up and distributed to families in time for the holiday. 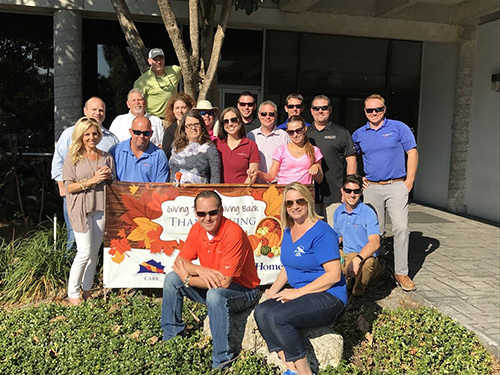 In Tampa, the Thanksgiving Drive benefitted Feeding Tampa Bay, an organization dedicated to fighting hunger by providing food, emergency assistance and aid to the more than 70,000 hunger-stricken population in Tampa Bay. Homeowners, real estate agents, developers, lenders, trade partners and team members from David Weekley Homes donated 18,500 pounds of turkey and nonperishable food items to Feeding Tampa Bay to benefit families in need. Feeding Tampa Bay, part of the national Feeding America network, focuses on providing food to the more than 700,000 hungry in the 10-county area of West Central Florida. Our mission is to change lives one meal at a time by leading our community in the fight against hunger.